Here are some of my favorite things that I’ve discovered and personally use and recommend. I hope you’ll try some of them and enjoy them too! There are quite a few singing bowl and chakra focused music files to choose from, but my favorite is the one. Each track is about 5 min. long and combines the drone sound of the Tibetan singing bowl calibrated to the frequency of each chakra with beautiful music. 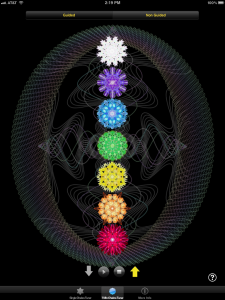 If you decide to do any of my in-depth chakra sessions- then I highly recommend you get these- at least the 7 chakras (regular)- which are the ones with the music track as well as the singing bowl drone. I reference these audios in my audio presentations, but due to copyright issues, I couldn’t include them in my audio recordings- so please download these separately and use them if you do the course. Even if you don’t do the course, these are great tracks to listen to for a few minutes each day. If its’ Monday, listen to the 1st chakra track, Tuesday- the 2nd chakra track, etc. What I love about these is that as you close your eyes and just feel inside your body while you listen to the tracks, you can actually feel the area of each chakra vibrating and resonating to the frequency of the penetrating drone. This can help you begin to develop a sensitivity for feeling your chakras so they aren’t just mental concepts, but felt experiences. I love this app and use it every day! Jonathan Goldman is a master of sound healing. The vowel sounds that he uses in this app are slightly different than the ones I chose and suggest as part of the Spiral Up Yoga system, but it isn’t a big deal really- there are several sounds that can work for each chakra. The great thing about his app is that you can listen to the right frequency tone and hear the voice toning while you use your own voice to tone in tune to the frequency and feel the sensation of each chakra in your own body as you do. I personally use this app for 5 minutes every day as a warm up to my meditation time as it calms my mind, centers my attention in the energy body and puts me in a present-minded, quiet state. It’s $2.99 on the Apple App Store. I don’t think they have one for Android yet. I’ve tried a lot of shorts that can work both for normal everyday wear and for doing yoga asanas in. These are the best in my opinion. Not cheap for shorts, but they are the only shorts I wear now. I have several colors and wear them most every day around the home. Most days I’m wearing these when I do my own Spiral Up Yoga practice. This might seem a little weird, but it’s something I use every morning to scrape my tongue. The tongue is an important but poorly understood part of the body’s detoxification system. Chinese medicine recognizes the importance of the tongue in overall body health, but western medicine isn’t as aware of this. It’s inexpensive, but very durable being 100% stainless steel. Try it and see what comes off your tongue in the morning! To me this is an important but very neglected aspect of dental hygiene and overall physical health- not to mention getting at the root cause of bad breath! This is another somewhat unusual thing I use and recommend. The nasal cavities are another really important part of our body’s detoxification system that is very neglected. If you suffer from frequent nasal congestion or allergies, you may find this helps a lot. I fortunately, don’t have many issues with that, but I still like having clear and clean nasal cavities. It helps for doing yoga and pranayama and meditation to have open and clear nasal cavities. I fill the rinse container with distilled water (as recommended by the manufacturer) and warm it up a bit in the microwave so it’s a little warm, but not hot. Then you put in the little saline packet and shake it up. Then, standing over your bathroom sink you insert the top of the container into one nostril and gently squeeze the bottle until it’s about half empty. The warm saline solution will go up one nostril, clean out the nasal cavity and come out the other nostril. Then you use the other half of the bottle on the other nostril. Keep your mouth open while you do this as sometimes some of the water will come out of your mouth. Sticking with the daily detoxing theme, I love this product. I’ve been using it for years. It’s a daily fiber formula that includes pro-biotics and natural fiber. It is nearly tasteless and mixes well in distilled water (I have a water distiller which I also love). I will either just drink a glass of this at night or put a spoonful in a protein shake in the blender. I have this on automatic shipment from Amazon. Foot care is another often neglected but important part of your body’s health. The health of the feet is a reflection of the health of the first chakra. I like to use the wooden roller to stimulate and sensitize the soles of the feet which can become very desensitized and rough but are meant to be smooth and sensitive. the Amope is a great little tool for removing dry skin layers from the heel and other parts of the foot. If you sometimes get dry cracking heels, the heel socks with gel pads are a great thing to put on before going to bed to help heal your heels. I love my Audible subscription. I listen to books and talks all the time as I am walking or riding my bike or driving in the car.